When the Mongols engaged an opponent’s field army, they used a wide array of tactics to achieve victory. One such tactic, usually the opening one, was a barrage of arrows from a distance. Although this opening volley often inflicted little harm, it allowed the Mongols to see how the enemy would react. To remain in a position under constant fire probably became frustrating, especially for elite units. For massed infantry, often haphazardly armored, it became precarious. From the Jürcheds, the Mongols adopted a troop composition of roughly 60 percent light cavalry and 40 percent medium-to-heavy cavalry. Army formations essentially consisted of five lines. The first three lines were light cavalry, and the last two were heavy cavalry. During battle the light cavalry released numerous barrages of arrows upon their opponents before retiring to regroup behind the heavy cavalry. After the opponent had become sufficiently disorganized, or after the Mongol commander decided to deliver the final blow, the heavy cavalry would trot forward in silence, accompanied only by the pounding of drums. Just before contact, the riders would release a terrific, collective scream, intended to frighten their opponents. The key element in battle remained the Mongol barrage, or “storm,” of arrows, after which the Mongols would base their ensuing actions on their observations of their enemy. They would opt either for an enveloping maneuver or for a continued arrow barrage, at a closer, more destructive range. Another tactic was the mangutai, or the so-called suicide attack. In this maneuver a select group of Mongols would harass the enemy lines, showering them with arrows at close range until the enemy finally broke ranks and charged. 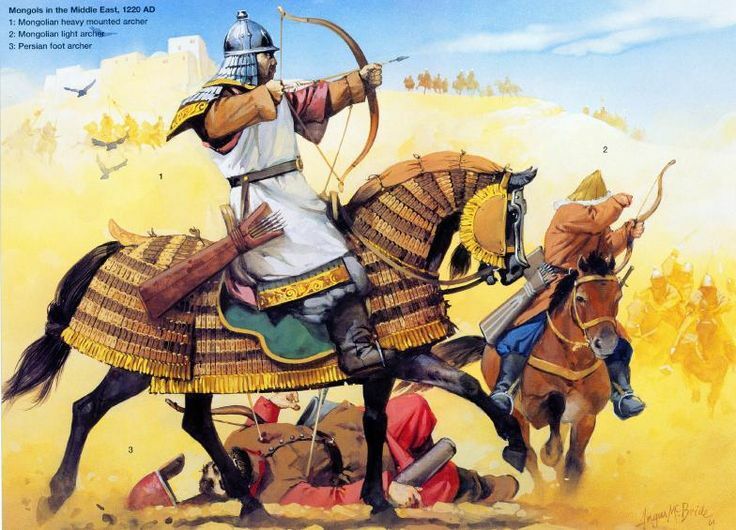 The Mongols would then flee, still firing their arrows by turning backward in their saddles, a technique known as the Parthian shot, perfected and made famous by Parthian warriors of ancient Persia. After the pursuing forces became strung out and disorganized, the majority of Mongol forces would then charge. Often these forces had been waiting in ambush along the flanks, or were in fact the mangutai troops, who had mounted fresh horses. The pursuing forces would be unable to withstand the cohesive force of the Mongol charge. This maneuver-the feigned rout-was an old steppe trick, one that the Mongols raised to perfection. In the encircling maneuver the Mongols often left a gap between their lines. Eventually, the encircled foe would detect the gap and attempt to escape through it, inevitably leading to a rout, during which the Mongols would pursue and cut down the fleeing soldiers. The Mongols conducted the majority of their battles at a distance. They possessed a great advantage in the power of their bows and believed in the principle of massed firepower, coordinating their fire arcs through the use of banners, torches, and whistling arrows. Much like that of modern directed artillery fire, the effect of massed Mongol firepower could be devastating. Mongol use of massed firepower also applied to sieges. At Aleppo in 1400, the Mongols arranged twenty catapults against one gate. The Mongol use of massed firepower-decades before the English use of massed longbow archers-reduced enemy armies, and with catapults and ballistae, demolished city defenses. Other Mongol tactics included psychological maneuvers. The Mongols often lighted more campfires than normal to make their camps appear to be larger than they were. At times they also mounted dummies on their spare horses, so that their armies would appear from a distance to be larger than they were. Tamerlane contributed the trick of tying branches to the tails of his horses, so that enormous clouds of dust could be seen from a distance, deceiving his enemies. Merchants who served as spies spread rumors far in advance of the army. Furthermore, Mongols treated with leniency cities that surrendered, whereas they crushed mercilessly those that opposed or rebelled. In terms of strategy, the Mongols had a set method of invasion that varied only slightly from campaign to campaign. The Mongol army invaded in several, usually three, columns: a center force and two flanking corps. The flanking units, in some instances, went into neighboring territories before a rendezvous with the center army, as in the Mongol invasion of Hungary in 1241. 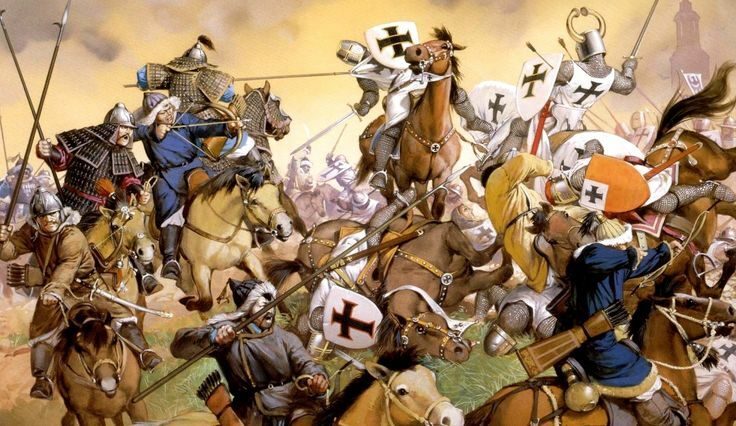 Armies sent into Poland distracted the Poles, the Teutonic Knights, and the Bohemians from joining the Hungarians. A screen of scouts and outriders constantly relayed information back to the column. Their preplanned schedule and use of scouts allowed the Mongols to march divided, but to fight united. Furthermore, because their forces marched in considerably smaller concentrations, the Mongols were not impeded by columns stretching for miles. They used their mobility to spread terror on many fronts at the same time; their opponents were rarely prepared to concentrate their forces against them. The Mongols’ use of many-pronged invasions also fit in with their preferred method of engaging the enemy. The Mongols preferred to deal with all field armies before moving deep into enemy territory. Because the enemy usually sought to meet the Mongols before they destroyed an entire province, reaching this goal was rarely difficult. Furthermore, the Mongols’ use of columns and a screen of scouts enabled the gathering of intelligence that usually allowed the Mongols to unite their forces before the enemy was cognizant of all the different invading forces, thus better concealing their troop strengths. This arrangement also meant that an embattled force could receive reinforcements or, in the advent of defeat, could be avenged. By concentrating on the dispersion and movement of field armies, the Mongols delayed assault on enemy strongholds. Of course, the Mongols took smaller or more easily surprised fortresses as they encountered them. The destruction of the field armies also allowed the Mongols to pasture their horses and other livestock without the threat of raids. One of the best examples occurred during Genghis Khan’s Khwarizm campaign (c. 1220). The Mongols took the surrounding smaller cities and fortresses before capturing the principal city of Samarqand, in modern Uzbekistan. This strategy had two effects. First, it cut off the principal city from communications with other cities that might provide aid. Second, refugees from these smaller cities fled to Samarqand, the last stronghold. The sight of this streaming horde of refugees, as well as their reports, reduced the morale of the inhabitants and garrison of the principal city and also strained its resources. Food and water reserves were taxed by the sudden influx of refugees. Soon, what once had seemed a formidable undertaking became an easy task. After conquering the surrounding territory, the Mongols were free to lay siege to the principal city without interference of a field army. Smaller forts and cities could not harry the Mongols, who either foraged or pursued other missions during the siege. Most important, the many Mongol columns and raiding forces had prevented the main city from effectively assisting its smaller neighbors without leaving itself open to attack. Finally, the capture of the outer strongholds and towns provided the Mongols more siege experience as well as raw materials in the form of labor either to man the siege engines or to act as human shields for the Mongols. The Mongols also strove to destroy any hopes their opponents had to rally by harrying enemy leaders until they dropped. Genghis Khan first did this during his unification of Mongolia. In his first few encounters, the enemy leaders had escaped, which continually haunted him. After this lesson, the Mongols habitually hunted down opposing leaders. In Khw3rizm Sultan 4Al3 al-Din Muwammad (r. 1200- 1220) died alone on an island in the Caspian Sea after being hounded by Jebe and Sabutai. 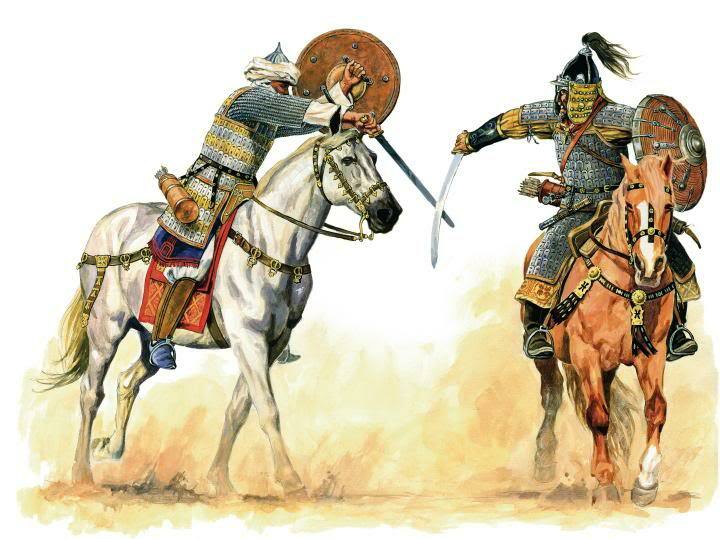 Mongol units relentlessly pursued Jalal ad-Dtn Mingburnu (r. 1220-1231), Muwammad’s son. Béla IV (1206- 1270), king of Hungary, barely escaped the Mongols, led by Batu Khan (died 1255), in 1241, as his boat pushed off of the Dalmatian coast into the Adriatic Sea. Constantly on the move to avoid the Mongol forces, an enemy leader was unable to serve as a rallying point for his armies, who were also required to keep moving in order to find him. In many reports, the enemy leaders were only a few steps ahead of the Mongols. This strategy also allowed the Mongols opportunities to acquire new intelligence on other lands, because fleeing leaders ran in the opposite direction of the Mongols. The pursuing Mongol forces could then wreak havoc in new territories. Local powers would keep their forces at home, instead of sending them to help their overlords. In many instances the Mongols would defeat local armies they encountered along the way while avoiding the strongholds, another example of the Mongol method of destroying field armies before laying siege. The most important aspect of these pursuit columns was their capacity for destruction and intimidation, which created a buffer between the currently occupied territories and those that recently had been subdued. Thus, the main army could finish its mission of subjugation while the surrounding environs were devastated and rendered harmless. Books and Articles Biran, Michal. Qaidu and the Rise of the Independent Mongol State in Central Asia. Surrey, England: Curzon, 1997. Gabriel, Richard A. Subotai the Valiant: Genghis Khan’s Greatest General. Westport, Conn.: Praeger, 2004. Hildinger, Erik. Warriors of the Steppe: A Military History of Central Asia, 500 B. C. to 1700 A. D. New York: Sarpedon, 1997. Reprint. Cambridge, Mass. : Da Capo Press, 2001. Hull, Mary. The Mongol Empire. San Diego, Calif.: Lucent Books, 1998. Jackson, Peter. The Mongols and the West, 1221-1410. New York: Pearson Longman, 2005. Kennedy, Hugh. Mongols, Huns, and Vikings: Nomads at War. London: Cassell, 2002. Manz, Beatrice Forbes. The Rise and Rule of Tamerlane. Cambridge, England: Cambridge University Press, 1989. Martin, H. D. The Rise of Chingis Khan and His Conquest of North China. Baltimore, Md. : Johns Hopkins University Press, 1950. May, Timothy. The Mongol Art of War: Chinggis Khan and the Mongol Military System. Barnsley, England: Pen and Sword Military, 2007. Morgan, David. The Mongols. 2d ed. Malden, Mass. : Blackwell, 2007. Prawdin, Michael. The Mongol Empire: Its Rise and Legacy. London: Allen and Unwin, 1940. Reprint. New Brunswick, N. J. AldineTransaction, 2006. Saunders, J. J. The History of the Mongol Conquests. London: Routledge and Kegan Paul, 1971. Reprint. Philadelphia: University of Pennsylvania Press, 2001. Turnbull, Stephen. Genghis Khan and the Mongol Conquests, 1190-1400. New York: Routledge, 2004. _______. Mongol Warrior, 1200-1350. Illustrated by Wayne Reynolds. Botley, Oxford, England: Osprey, 2003. This entry was posted in Mongol by MSW. Bookmark the permalink.